by Lori WeaverAs retailers begin to offer E15 to consumers, this small crack in the blend wall will soon grow. by Kayla SchlechterThe lab team members at POET ensure the quality of the fuel, feed and co-products that leave each biorefinery. by Steve Lange, photo by Greg LatzaPOET’s Vice President of Corporate Affairs, Doug Berven, spends his time advocating ethanol to groups around the world. by Steve Lange, photos by Greg LatzaPOET-DSM Advanced Biofuels' collection of biomass gives farmers a no-hassle approach to being a part of the future of ethanol. Liberty Update: Spring 2014Project LIBERTY, the POET-DSM Advanced Biofuels commercial-scale cellulosic ethanol plant near Emmetsburg, Iowa, is entering the final legs of construction. by Lori Weaver, photo by Greg LatzaAt one point, distillers grains were only considered the by-product to ethanol; an alternative feed ingredient at best. Now, it’s sought out for rations, coming in only second to corn. 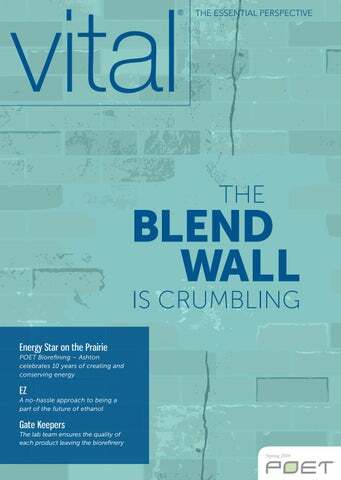 by Jeff Broin, Executive Chairman and Founder of POETThe first domino has fallen in overcoming the ethanol blend wall.